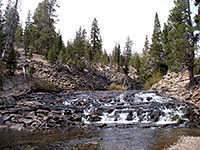 One of the smallest NPS units in California, Devils Postpile National Monument occupies a rectangle of land just 2.5 by 0.5 miles in extent, alongside the North Fork of the San Joaquin River in the central Sierra Nevada mountains. 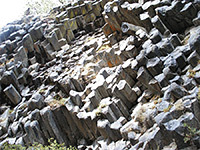 The river forms a powerful cascade (Rainbow Falls), and the surroundings are a typically beautiful Sierra combination of granite, forest and hills, but the main attraction is an outcrop of volcanic basalt composed of parallel, multi-sided columns, a relic of long ago eruptions from a nearby volcano. 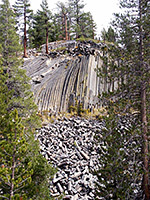 The basalt covers a large area of the adjacent Inyo National Forest, but this particular formation is exceptional for its regularity and symmetry - although the feature is not unique, with a dozen or more other notable sites across the world (including Devils Tower National Monument in Wyoming), the Postpile is still most unusual, and rightly considered one of the top geological sites in California. Despite its importance, the site is not particularly well known and receives comparatively few visitors, for several reasons. The monument lies just west of the Sierra crest and suffers from heavy snowfall in winter, causing the access road to be open only for 5 months a year, usually from mid June to mid October. There is no through road across the mountains, so the only approach is from the more remote east side of the Sierras, a long drive from the major population centers in the west of the state. Also, as part of the park road is very narrow and parking on the valley floor is limited, for most of the season private vehicles are not allowed and instead visitors must enter by shuttlebus, starting from the Main Lodge at Mammoth Mountain, 8 miles from the monument boundary. The approach to the Devils Postpile National Monument is along Highway 395, turning west 38 miles north of Bishop, towards the ski resort of Mammoth Lakes. The road climbs gradually through town then more steeply beyond, curving round the north face of Mammoth Mountain (a dormant volcano), and up to a high point of 9,187 feet at Minaret Summit, part of the eastern crest of the Sierra Nevada; a short side road leads to a viewpoint of a large area of mountain wilderness to the west, backed by the rugged peaks of the Ritter Range. Just beyond the turn-off is a fee station operated by the US Forest Service; although the monument, 7 miles further, has no entrance fee, the USFS charge $10 (2019) to cross the intermediate land, and use the money in part to maintain the access road. So, in early or late summer, visitors pay here and drive on, while at all other times their trip starts a mile back at the ski lodge, by catching the shuttlebus. This stops at all important places along the road, ten locations in all, and people may get on or off as often as desired. In winter, the road is plowed only to within half a mile of the summit, though entry to the national monument is still possible via cross-country skiing. Ten miles east, Mammoth Lakes has a fair selection of hotels - follow the link for hotel descriptions, reservations and location map. The road crosses Minaret Summit then turns north and descends steeply across the west side of a ridge, down 900 feet over 2.5 miles. Most of this section is a single carriageway, with frequent pull-outs, but the road widens when it enters the wooded San Joaquin River Valley. The remaining 5 miles pass various lakes, trailheads and campsites (see map), all still on national forest land; the postpile is reached by a spur road, and Rainbow Falls by a trail that again runs mostly outside the national monument. The first points of interest along Minaret Summit Road are a short nature path (Wildflower Trail), then a small tree-lined lake (Starkweather), good for fishing. Next are three campsites - Soda Springs, Pumice Flat, Minaret Falls - before the road arrives at the turning for the main formation. 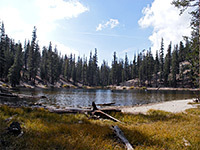 Half a mile further is a larger lake (Sotcher), backed by the vast slopes of Mammoth Mountain, rising 3,500 feet above. A one mile loop path circles the shoreline, and the lake itself is popular for boating as well as fishing. South of Sotcher Lake the trees open out a little to Reds Meadow, which has another USFS campsite and several trails. The road ends soon after the campsite, at Reds Meadow Resort; a private facility offering lodging, a cafe, a general store, and horse rides. Nearby is a parking area for the path to Rainbow Falls and Lower Falls, a route that links with the long distance John Muir and Pacific Crest Trails. pleasantly situated right next to the San Joaquin River which here flows through a shallow canyon edged by layered volcanic rocks. The formations are reached by a 0.4 mile trail that crosses a tall grass meadow then winds through pine trees beside the river to the base of the cliffs. 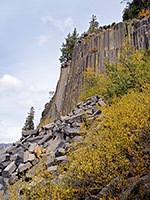 The postpile is a relatively small feature, about 500 feet long, made of straight, vertically aligned columns on one side and extravagantly curved pillars on the other, below which is a big talus pile of fallen blocks, some several yards long. Many of the posts are edged by bright yellow lichen, presenting an attractive color contrast. Climbing over the talus pile or up the cliffs is not allowed, and as the path runs below the cliffs but quite close to them, it isn't so easy to photograph the scene effectively. One good vantage point is on top of a small hill opposite, from where the angle of view is more direct, albeit partly obscured by trees. 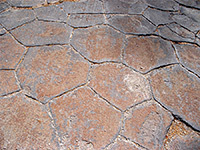 The path loops around and above the cliffs, passing the formation at alternative angles; the south edge has the basalt columns horizontal, presenting a jumbled mixture of polygons, broken off at different lengths. On top of the cliffs the columns are vertical, polished smooth by glacial action to create a flat pavement of hexagonal flagstones. The main pillars are not visible from the path over the top, and straying from the trail is discouraged, though as well as the pavement this section of the route has good views over the nearby river canyon; this is made largely of the same basalt rock, and some parts also have a columnar structure, though much less regular. All can be seen in around half an hour, so for many the national monument provides a rather short visitor experience, but taking some of the other short trails in the surrounding national forest and the longer path to the two waterfalls can use up a full day. One option for a longer hike is to continue 2 miles past the postpile to link with the Rainbow Falls Trail, continue to the falls, return to the trailhead for that hike then catch the shuttlebus back to the visitor center.